ticking? 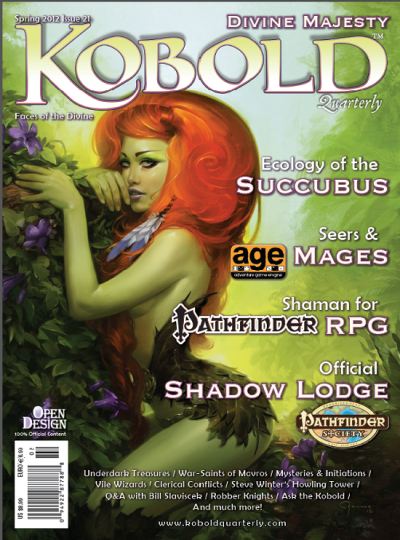 Yes, Kobold Quarterly magazine #17 is all about the rogues and villainy! Ambush in Absalom: Our first official adventure for Paizos Pathfinder Society, a little piece by Mark Moreland. “So We Meet Again!” Special adversary abilities for recurring villains and the PCs who hate them. These adversary mechanics give recurring villains and PCs the ability to uniquely track, thwart and escape each another over many adventures. For Pathfinder RPG. The Right Way to Do Wrong: Brandon Hodge presents classic swindles for your rogue to play. Say, would you watch this violin for a second? Scourges of Vael Turog: Arcane diseases to really bring on the sweats for your 4th Edition D&D PCs! This article actually gave our Gearforged Copywriter pneumonia. True story. Know Why You Play: Jeff Tidball gives us both an insightful interview and the complete scoop on the Dragon Age RPG stunt mechanic, and how to adapt it to D&D or Pathfinder. Elf Needs Food, Badly: Yes, magical foods make an appearance, and are giving us a case of the nom nom noms! For 4th Edition D&D, easily adapted elsewhere. Magical Squibs and Firecrackers: Rockets, firecrackers, and squibs were good enough for Prof. JRR Tolkein in The Hobbit. Now they’re here for the Pathfinder RPG. The Black Goat: A tavern miniadventure for Pathfinder RPG that will leave your PCs changed…. Forever. Monkish Magic Items What magical items do ascetic materials of mind, body, and spirit need most? Find out for 4th Edition D&D! Group Concepts: Nine ways to kick off a perfect campaign, with the right concept for the PCs from the start. Excellent advice, with examples from the Midgard campaign setting. For Pathfinder, 4th Edition D&D, or any other fantasy RPG. Getting Ahead: Taking trophy heads and turning them into magical items might cross a line somewhere, but we’re guessing both PCs and villains will do anything to get a head when they see what these beauties do. For Pathfinder RPG. 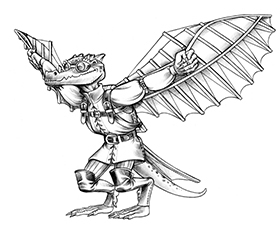 Ask the Kobold: Gaming legend Skip Williams takes on the use of magic items on companion animals, with rather amusing results. 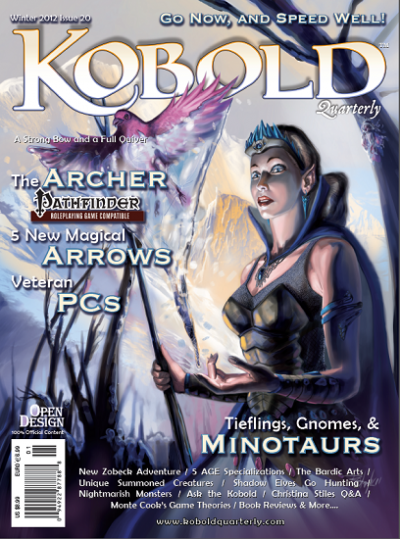 Not to mention monster advice from Monte Cook, two articles for the AGE System on stunts, plus book reviews, details of the Midgard campaign setting, and much, much more! 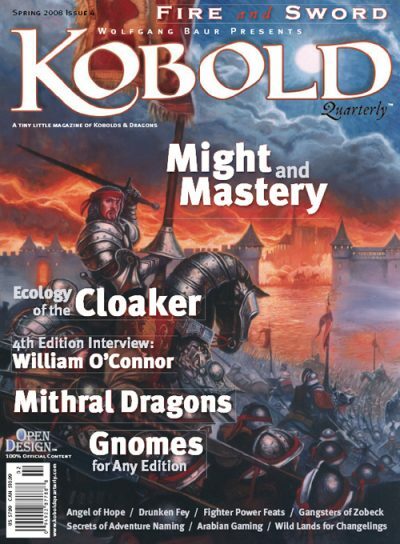 Kobold Quarterly #17 is replete with moustache-twirling villainy, classic crunch, and the finest RPG flavor available anywhere! Pick up your copy today!